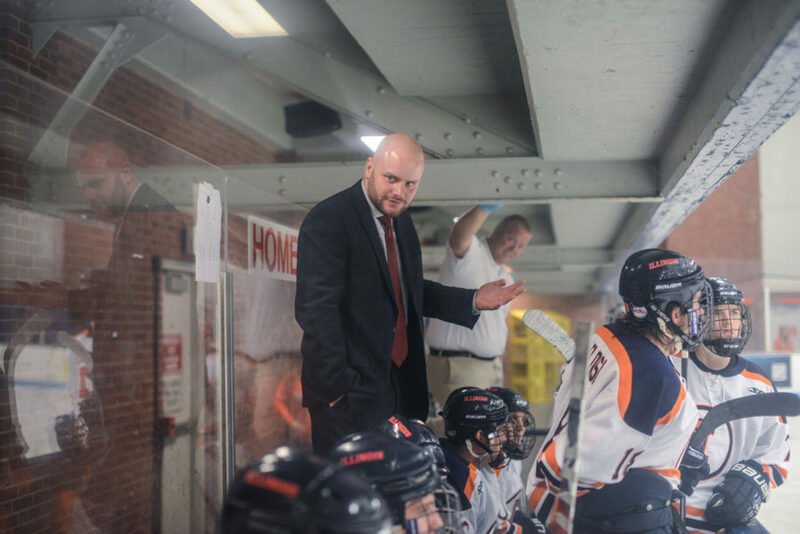 Illinois hockey head coach, Nick Fabrini, speaks to the team during the game against Michigan State on Saturday, September 27th, 2014. 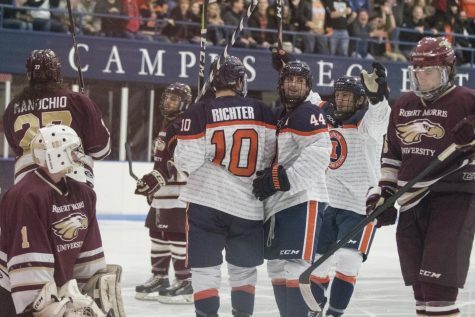 Illinois hockey head coach Nick Fabbrini struggled to find the right words when asked about the importance of playing Division II opponents to begin the regular season. Fabbrini was eventually able to find the right word to describe these early season matchups: opportunity. 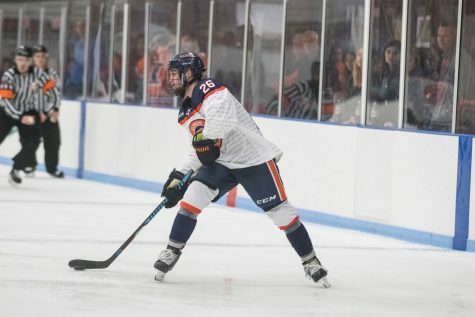 Fabbrini will use more opportunities this weekend to shake up his lineups before starting the Central States Collegiate Hockey League (CSCHL) conference slate in three weeks against Iowa State. 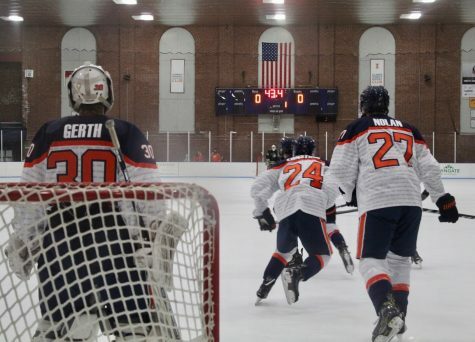 The Illini head to Johnny’s Ice House in Chicago for a weekend set against Lewis University, a Division II team. With these three opportunities, Fabbrini will give each of his returning goalies a start on the weekend. 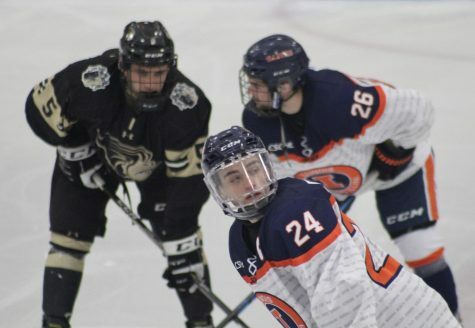 Defending CSCHL MVP Joe Olen will get the nod on Thursday before senior Zev Grumet-Morris and junior David Heflin split duties against Lewis. 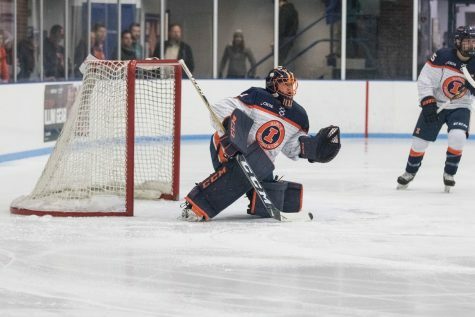 The Illini opened the regular season last weekend with a 6-2 victory over the Redbirds before grabbing a pair of wins against Michigan State at home to run Illinois’ record to 3-0. 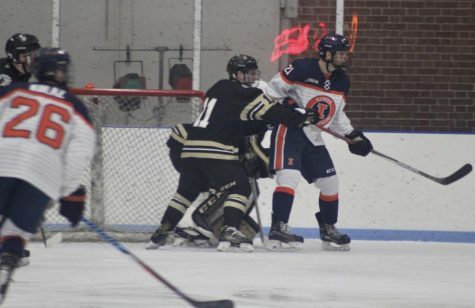 Fabbrini changed his top line mid-game on Friday with the Illini trailing the Spartans, 2-1. 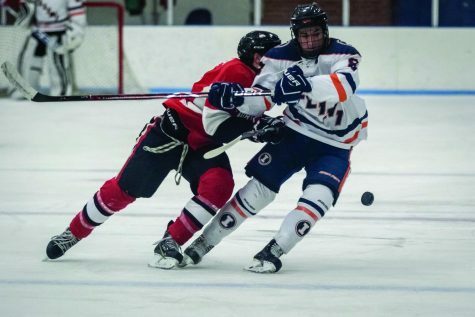 He inserted junior Shaunak Pal onto the top line with James Mcging and Eric Cruickshank. The move sparked Cruickshank’s six-goal, two-assist weekend, highlighted by a hat trick on Saturday. “(The change) helped us and strengthened the lines, and you could see it on Saturday when we were much tighter, and everything worked out well,” Cruickshank said. Fabbrini is looking to improve the team’s special teams play this weekend. 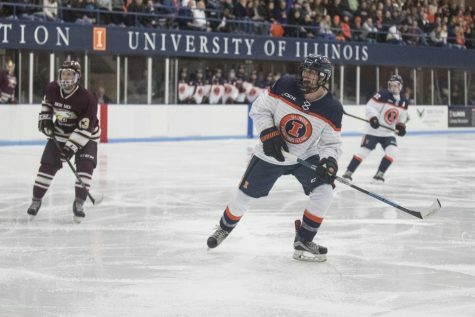 The Illini garnered 57 penalty minutes over the three games, including 28 minutes against Illinois State alone — allowing five penalty kill goals. Lewis University enters this weekend’s matchup 2-3-0-1 overall but finished the 2015-16 campaign 20-5-1-2. Sophomore center Patrick Nelson leads the Flyers with two goals and seven points. Fabbrini said he expects Lewis to be similar to Michigan State in talent level.